We first mentioned Baby Sensory classes when they launched this time last year. Since then their success has been phenomenal. If you haven’t tried them yet make sure you sign up now! Baby Sensory, one of the most popular baby classes on our doorstep, celebrates a year since opening this month. Babies from just a few weeks to over a year old attend these award-winning baby development classes in Carshalton, Banstead or North Cheam. Several have just completed the whole year of different lessons! Parents also enjoy the chance to chat as everyone goes to the exploratory play area halfway through the hour-long class so babies can play or relax and parents can catch up. 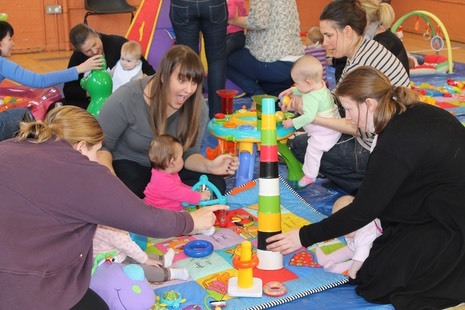 The classes also provide parents with hundreds of ideas for activities that they can do with their babies at home. Baby signing, for example, is a great way to develop speech and language; movement activities can help with the development of sight and hand-eye co-ordination, which is so important for later reading and writing. The classes run in 10-week blocks and have been full since launching. In Carshalton three classes run on Fridays on Ruskin Road (10am, 11.30am and 1pm). Classes also run in Banstead on Thursdays (10 am, 11.30am and 1pm) and North Cheam on Tuesdays (10am and 11.30am). Anyone can attend a free taster and join the class at any time providing there are spaces.�Baby Sensory�also runs first birthday parties.